“Teaching to the Test” has become a political slogan with negative connotations, but teaching to standards, against which students are later assessed, has long been considered a good teaching practice. In my previous posts I looked at practical and theoretical support for ‘teaching to the standards’ (Part 1), and the reasons why ‘teaching to the test’ has acquired momentum as a negative slogan (Part 2). Today we will look at a way forward: how should our schools respond to state standards and mandated testing? This entry was posted in Standards and Testing on October 28, 2015 by Bob Sage. Sent in my absentee ballot …. This entry was posted in Election 2015 on October 28, 2015 by Bob Sage. 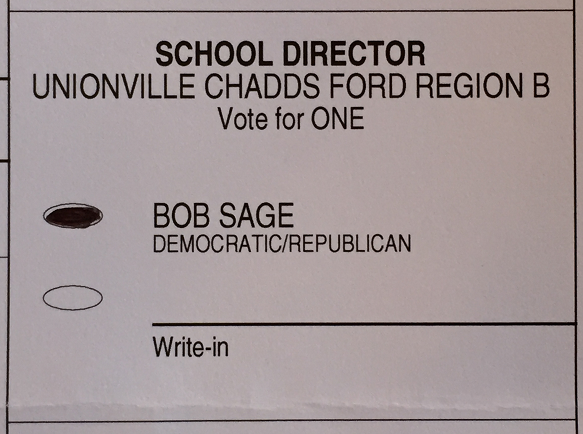 The Unionville Chadds-Ford School District now has a vacancy on the school board due to the resignation of long-time school board member Mr. Keith Knauss. Please consider whether you or someone you know might be interested in serving our community on the School Board. The successful applicant will represent region A, and must be a resident of East Marlborough Township or West Marlborough township. Applications are due November 6. Details on the vacancy and the application process can be found on the UCFSD web site here. This entry was posted in Uncategorized on October 26, 2015 by Bob Sage. Even though I am unopposed on the ballot November 3, I think it is important for voters to know what I will work for on the School Board for the next four years. Below are links to the six pillars of my campaign, outlined earlier this year. This entry was posted in Election 2015 on October 23, 2015 by Bob Sage. One of my readers, who is also a school administrator, sent me a link to a useful article from Inside Higher Education, called “Teaching to the (Right) Test”. Educational innovation is an iterative process. Preparing our lectures and designing our curriculums aren’t the end; they’re closer to the beginning, in fact. We must demand evidence that education — in general and in each course we offer — is “working.” When we have articulated the learning goals and designed tools for assessing their attainment, we are in a position to get that evidence. In assessing our students, we can determine how well our curriculums and teaching strategies are helping them meet the learning goals. Importantly, we can also use the evidence from the assessments to modify and improve the efficacy of our lesson plans and teaching strategies. This evidence from assessments guides us toward the more effective methods, and helps us revise the less effective ones. A disastrous reality is that most teachers in higher education today receive little or no training in assessment. This mirrors the situation among K-12 teachers. A 2012 report by the National Council on Teacher Quality revealed that only “3 percent of teacher preparation programs adequately build teacher’s skills in the crucial area of student assessment.” We all can use help and we all can improve. Their conclusion about testing and instruction? When learning goals are clearly defined and reliable assessments are aligned with them, “teaching to the test” is not only good, it is exactly what we should be doing. This entry was posted in Uncategorized on October 22, 2015 by Bob Sage. In my previous post I showed that “teaching to the test” has long been considered a sound instructional practice. When it comes to teaching AP history or a foreign language, it seems obvious that instruction seeks mastery of a specific curriculum, and that mastery is measured by a valid assessment. This entry was posted in Standards and Testing on October 20, 2015 by Bob Sage. “Teaching to the Test” has become a catch phrase in the testing debate. And like many political slogans, it is designed to evoke a certain (negative) emotional response from us. But if we carefully examine the ideas behind “teaching to the test”, we may find our negative response to be unwarranted. “Teaching to the Test” is used today mostly in a derogatory way. According to the critics, standardized testing drives schools to “teach to the test”. And if teachers must “teach to the test” then they will have to sacrifice other important learning objectives. This may happen at a macro-level if schools sacrifice Social Studies, Art, and Music on the altar of higher test scores in Math and English Language Arts. Or it may happen in the classroom as rote memorization and pre-test drills crowd out higher-order learning and project work that would better serve our students. Or so goes the argument. This entry was posted in Standards and Testing on October 14, 2015 by Bob Sage. A number of local offices are on the ballot on November 3, including five of the nine Unionville -Chadds Ford School Director seats. Sample ballots, organized by voting precinct are here. If, like me, you will be out of town on November 3, you should apply for an absentee ballot. The deadline to apply is October 27, and the completed ballot needs to be received back on Friday October 30. This entry was posted in Election 2015 on October 8, 2015 by Bob Sage. This entry was posted in Standards and Testing on October 5, 2015 by Bob Sage.